Kell Brook proved his world title credentials with a classy, high-profile win against British welterweight rival Matthew Hatton in Sheffield. Brook, 25, was under pressure to impress as he topped the bill in front of 10,000 fans at the Motorpoint Arena in his home city. He managed to do that against Hatton, boxing smartly in a scrappy encounter, to win a unanimous decision and move himself even closer to an inevitable world title shot later this year. Brook, carrying a 26-0 (18KOs) record into the fight, was a heavy favourite with bookmakers who perhaps overlooked Hatton's experience and recent form. The 30-year-old, despite a relatively modest 42-5-2 (16KOs) record, has hit his peak in recent years and showed he can mix it with the best when he survived 12 rounds against WBC light-middleweight champion Saul Alvarez last year. He was hoping to upset the odds against Brook to earn another title shot - this time at his natural 10 stone 7lb weight - but Brook was similarly eager to press his claims for world honours. 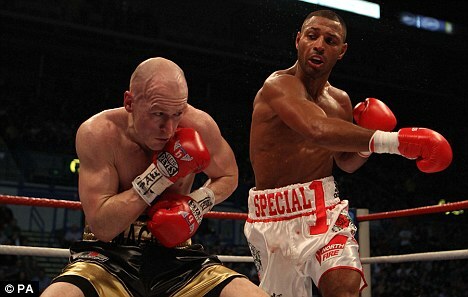 Amid a raucous and sometimes violent atmosphere, the two sized each other up for the opening minute before Brook established himself with the cleaner shots, bloodying Hatton's nose late in the opening round. A left hook counter by Brook early in the third seemed to hurt Hatton for the first time. Hatton did land a solid reaching right before the bell but it was a rare moment of success. He continued to push for openings but was largely frustrated as Brook's superior speed and timing continued to give him the advantage. 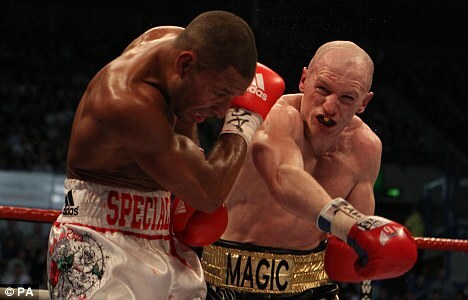 Brook's hard jab worked away at Hatton's damaged nose, undoubtedly hampering the older man's breathing. Hatton started the fifth well but Brook quickly turned it around, rocking the Mancunian with a left hook and follow-up right. Hatton was in survival mode, managing to escape the corner and survive the round. A straightforward left-right seemed to hurt Hatton in the sixth but the experienced 'away' fighter recovered well. Another right had him in trouble again soon after and Brook smelled blood. Again, Hatton held on and briefly fired shots back, including a quick right followed by the jab. A winging right by Hatton in the seventh was perhaps his best punch of the night but Brook shook it off and resumed control quickly. Hatton was having a go, but the action was often scrappy the best of the round was a right to the temple landed by Brook. Hatton was down in the ninth and though referee Marcus McDonnell scored a knockdown, it seemed the Mancunian had slipped as Brook threw a left hook. Hatton landed a beautiful left hook early in the 10th, jumping into it and hammering home to Brook's jaw. The Yorkshireman overcame it with surprising ease, however. Brook had the crowd on their feet for the first time in the 11th when he briefly stepped up his aggression. Hatton was reeling for a moment as the onslaught continued but he got himself together to see out a scrappy session. Brook, who was marked up around the right eye heading into the final round, was still measured rather than gung-ho in his shot selection. He did look for the spectacular finish, driving Hatton across the ring, but had to settle for the points win with scores of 118-109, 119-108 and 119-107. On a strong undercard, Welshman Kerry Hope caused a major upset by outpointing previously-unbeaten Pole Grzegorz Proksa via majority decision to take the European middleweight title, while Belfast prospect Carl Frampton retained his Commonwealth super-bantamweight belt by knocking out Prosper Ankrah of Ghana.